I should have known that the Walk was not going to live up to the previews we saw months ago. The movie has been out for two weekends here in the U.S. and it was already down to playing in only one theater and for one showing per day. By all financial accounts - at least in the U.S. - it is a bomb. Once viewed, it is not difficult to see why. I can't say I'm a huge fan of Robert Zemeckis. Some of his movies have aged better than others, but it got to a point years ago that he seemed more interested in the visuals, the trickery and gadgets to manipulate film than he was in the actual story. 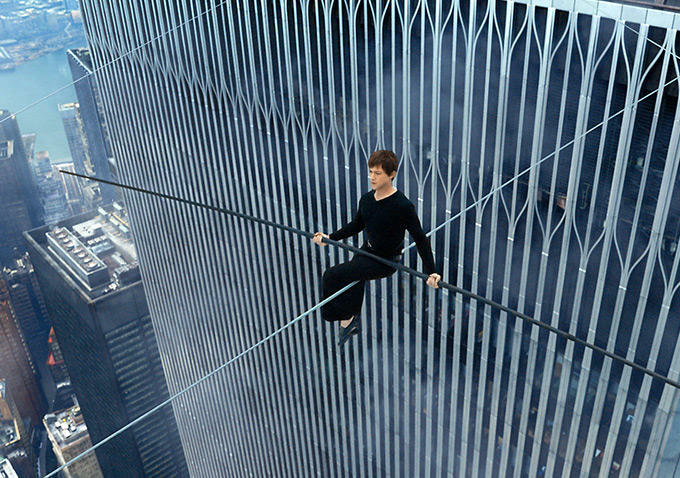 The tale of Phillippe Petit's high wire walk between the South and North towers of the World Trade Center, back in 1974, was fascinating, and in ways, suspenseful enough that Zemeckis didn't need to gussy it up with non-existent pressure points. He also couldn't be bothered with the French - English thing either. Petit (Joseph Gordon-Levitt) and most of his crew are French - so the dialogue goes in and out of French or English as needed - sometimes even in mid-sentence. Including the guy they set-up who can speak no English - until then he can........and in full sentences. Or the girl who when speaking English has zero French accent, like the others do, but speaks with a full non-regional U.S. dialect. I found it all annoying. The story was wayyyyy too slow moving at the beginning. It is not until Petit and his crew gets to Manhattan does the movie get any traction. Some of the CGI is good - I'll give Zemeckis that. The towers close up are good. The interior from the third floor to the lobby are fairly accurate. I'm sure the walk looked good in 3D IMAX. Trust me, they pulled the 3D IMAX version a week ago to make room for more profitable films. You can certainly see where some of the 3D would have come into play in other parts of the movie. One review said if you're not seeing it in 3D, there is almost no reason to go see the film. I actually believe that. There were reports of people throwing up in the theater due to the effects - maybe I'm not that squeamish, but I couldn't see that really happening. Let me see if I can put the matter in scientific terms. Philippe, in addition to being an aspiring wire walker, is a juggler, a mime and a unicyclist. He is, as I’ve mentioned, played by Joseph Gordon-Levitt. This makes him, objectively speaking, the most annoying person on earth. They did have Gordon-Levitt take off his shirt for almost no good reason, just so you could see his body. I mean - you gotta throw something in for the fans. Seven plus years ago when we saw the mockumentary, Man on Wire, I found that very appealing. I still do. I thought, even with re-enactments and no actual video footage (though plenty of photographs) that movie was so much heartfelt than Zemeckis' film. 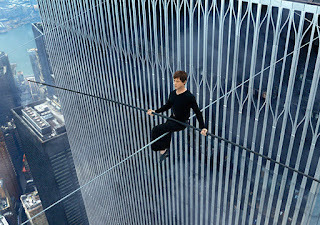 I would recommend Man on Wire before ever suggesting you see the Walk. With the former, there was no actual mention about 9/11. Zero. Technically, there is none in the latter either, but the last line and visual is so heavy-handed, they may as well just made the towers disappear via CGI. The Walk definitely is on one of the lower rungs of the movies we have seen this year. As someone who has a healthy crush on Joseph Gordon-Levitt, I thought about seeing this film, but even the previews seemed a little CGI heavy and I am not a fan of computers over acting. Maybe I'll do an internet search on shirtless Joseph Gordon-Levitt so I can, um, scratch that itch. I did see 'Man on Wire' in the cinema (can hardly believe it was that long ago, but you are correct, of course) and I quite liked it, so was wary about bothering to see this one covering much the same ground - in a manner of speaking. I too had heard that this new film has only the 3D CGI effects to commend it so finally gave it a miss. Looks like it was the sensible decision.